This embroidered pink elephant is just the right gift to welcome your new baby girl into this world. Plush pink elephants are wonderful keepsakes that she is sure to enjoy each year that passes by. Our plush pink elephant features soft, stitched eyes and is a light pink color with white on the inside of her ears, tip of her nose and bottom of her feet. Just simply perfect for your new baby girl to cuddle every day. Embroidered plush elephants for girls make adorable keepsakes they’ll enjoy each day. This embroidered elephant measures 8" and features big floppy ears to add more cuteness to her look. Free personalization is included with each elephant. We will embroider any name inside her right ear. Free gift wrapping and a free gift message are also included to create a thoughtful presentation. Additional Details Take a look at our entire collection of Embroidered Plush Animal Gifts from 800Bear.com. Any gift you choose will become a treasured keepsake enjoyed by all. 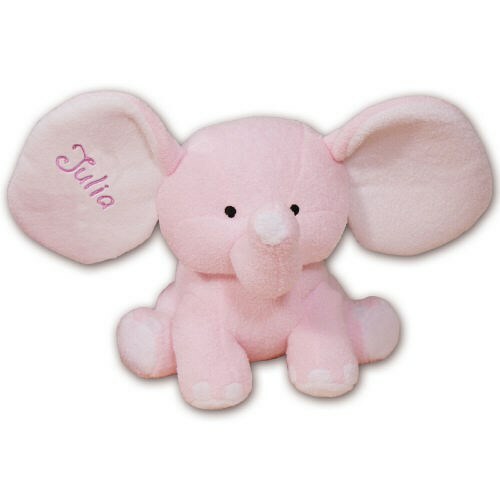 If you like this Embroidered Pink Elephant then be sure to also take a look at our Polka Dot Plush Elephant as well.